When it comes to "green" personal (rather than public) transport solutions, the only real options seem to be bicycles and electric cars, but I think the continuum in between those deserves more attention. 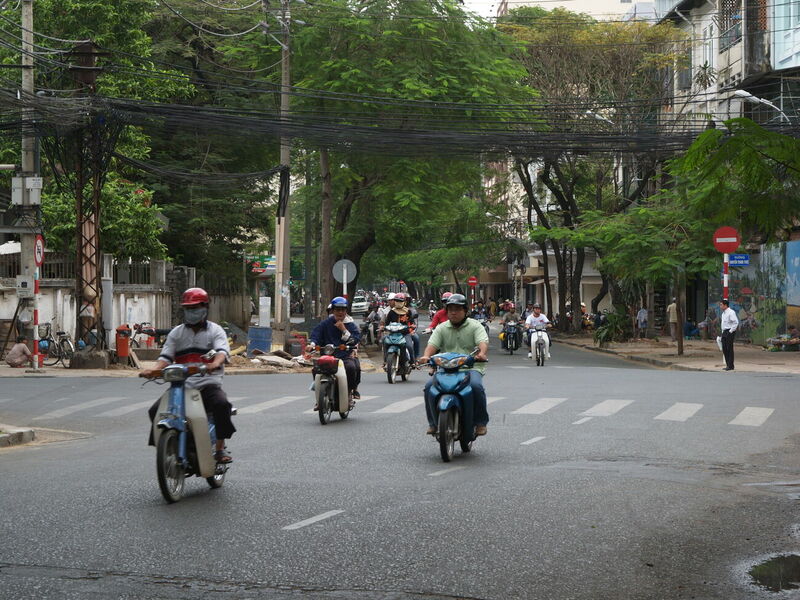 Two things have prompted thinking about this: observing the scooter/motorbike traffic in Ho Chi Minh City (Saigon) when I visited in 2009 and visiting the "Electric Transport" shop just around the corner from us here in Oxford. Having spent a year as a regular cyclist, I'm definitely sold on bicycles as a means of transport. But they have limitations when there are steep hills, for the elderly or infirm, in bad weather, or for moving goods around. Electric cars may emit less carbon than conventional cars, but otherwise preserve car culture and infrastructure pretty much unchanged; they still involve intensive resource and energy use and multi-ton steel objects moving around at high speed, killing hundreds of thousands of people a year — or regularly spending hours in traffic jams. The bicycles sold by the Electric Transport shop are not full-on electric bicycles, but power-assisted push-bikes. For legal reasons they are limited to 200 watts (in the UK and Australia, 250 in Europe), so they will help you get up a hill but won't manage that on their own. The next step up would be the very low power scooters that fill the streets of Saigon (Ho Chi Minh City). Accidents are common here - I saw a few myself just in the couple of days I was there - but happen at such low speeds that people just pick themselves up and get back on their scooters. In between this and a full-sized car (or even a "Smart car") is an empty niche, for what one might call a buggy or "light car". I'm thinking here of something small and light and cheap, not built to the same standards as an ordinary car but restricted to 40km/hr zoned streets, and maybe physically limited to 50km/hr or even less. These could be electric, and would be small enough to use different sized lanes and parking places to a full-sized car. They would also be designed with co-existence with bicycles and pedestrians in mind. Making either of these options practical might involve new kinds of licensing specifically for low-powered bicycles/scooters or light cars. It would also require the restriction of suitable areas to speeds of 30km/hr (20mph). Obviously this is not a practical option for dispersed suburbs in Sydney, but it might be feasible for much of London. Riding a bicycle on our roads to and from work, though I had thought about it long and hard, is not for me. It is simply too risky. I respect bike riders, and usually give them a wide berth. But the same can't be said about other motorists. I have no problems with bicycles that move at a good steady pace. It is the slow riders who hog the transit / bus lane that I find annoying. Whether it is the electric car, electric power-assisted bike or your conceptual in-between light car,there is a question which keeps on nagging me. What is the net gain in carbon reduction given that not all electric power is generated by renewable means. Are there environmental gains in driving electric cars knowing ultimately they are powered by fossil fuel-burning generators. How do you measure the benefits? Is there greater efficiency in turning fossil fuel into electrical power than burning fossil fuel in the internal combustion engine? Driving a bus in Oxford might be quite different to Sydney! In many places there are not only no bus lanes, but no separate bus stops per se. So when a bus stops to let people on or off that blocks the entire road, at least in one direction. This kind of effect helps to slow the traffic down and may make car drivers less annoyed by slow cyclists (there's not much point worrying about a delay when you're going to be waiting behind a bus in 100 metres anyway). Also, pretty much all of inner Oxford is zoned at 20mph (32km/hr), which changes the road dynamic completely. At that kind of speed, cyclists can co-exist with traffic much more easily. Yes, the carbon emission reduction with electric cars comes from electrical power generation being more efficient and less carbon-intensive than car petrol engines. Against that one has to offset the environmental costs of battery production and disposal. So I'm not convinced that electric cars are particularly green, especially as the most popular models seem to be large, high-end vehicles. old or young) also on local shopping excursions. pattern, which is to drive an F-150 everywhere. That's definitely the kind of thing I'm envisaging, anyway, as an alternative to a bicycle in inclement weather or for carrying heavier loads. On twitter, @shermozle points me at the BMW C1, an enclosed scooter built with an emphasis on safety and designed to be ridden without a helmet (though there are legal problems with that in some countries). This is exactly the kind of thing I was thinking of. Surely something like this - coexisting with push-bikes - has to be the future of inner-city transport? It's considerate of you to quote speed in U.S. units. Subdivisions are marked for 20 mph; most traffic ranges around 20-28 mph. Shopping and schools are almost entirely on or beyond throughways marked with limits from 35-50 mph. So, yes, the little carts sometimes are visible crossing traffic going at highway speeds--but then, so are we bicyclists. It's just so refreshing to see the carts moving where two-ton (!) behemoths are common. The UK has made the switch to metric for weights, but road distances and speeds here are still measured in miles and mph. One of the notable objects in the Museum of the History of Science here is a revolutionary French clock with a ten hour day. Downsizing electric cars is also happening. I've just discovered the Renault Twizy (YouTube video), which looks like a perfectly good urban transport solution when cycling isn't practical. Don't forget the electric wheelchair!